CompuHost provides for a number of User Preferences/Options that allow you to customize certain features and functionality provided by CompuHost. To access these options, select Main Menu->Options. When activated, double clicking a listing within the selected Song Request Queue or History will automatically launch the performance. When deactivated, double-clicking a selection will open the "Edit" dialog. When activated you must "double-click" the Karaoke Main STOP button to prematurely terminate an ongoing performance. This helps to avoid inadvertantly or accidentally terminating a performance . · Add All Song Requests to Performer's History at time of Request. When activated, all Song Requests made by a Performer will automatically be added to their History as though they had actually performed the selection. When NOT activated, selections are only added to the Performer's History AFTER actually performing the selection. When activated, Performer(s) that no longer have Song Requests in their Song Request Queue after completing a performance will automatically be DEACTIVATED within the Performer Rotation. When activated, Performer(s) that no longer have Song Requests in their Song Request Queue after completing a performance will automatically be DELETED from the Performer Rotation. 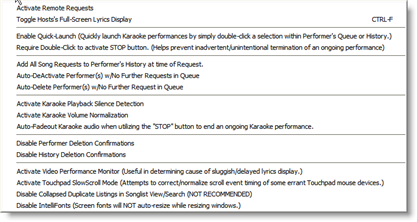 · Auto-Fadeout Karaoke audio when utilizing the "STOP" button to end an ongoing Karaoke performance. When activated, the Karaoke Audio will "fade away" when utilizing the "STOP" button (V) (Main Screen) to prematurely halt an ongoing Karaoke performance. This is useful for eloquently ending a long outro (non-vocal, instrumental conclusion of a song). When activated, you are no longer prompted to confirm the deletion of a Performer. When activated, you are no longer prompted to confirm deletions from the Performer History. When activated, the Video Performance of the computer is constantly monitored. If the Video speed capabilities of the computer are found insufficient to "keep up", a warning dialog will appear. This is useful in determining the cause of "lagging lyrics" etc. When activated, the Collapsed Search Results feature is disabled, thus ALL duplicates will be displayed in the results set. This may impose a significant impact on Search Performance, as well as produce a much larger results set to search through, therefore activating this option is NOT recommended. When activated, CompuHost will NOT automatically resize Onscreen Fonts.